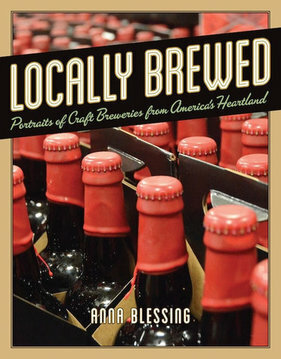 In the introduction to Locally Brewed: Portraits of Craft Breweries from America's Heartland, author and photographer Anna Blessing writes that she wants "to tell the story of the people behind the beer." She provides glimpses of 20 Midwestern craft breweries and their oft-tattooed brewers, their music, their humble beginnings and cult-like followings. These breweries make anything from lagers to sours, from beers inspired by Latin America to beers inspired by candy bars. They represent a sliver of an industry that has continued to grow while the overall U.S. beer industry has declined. This is an exciting time for craft beer, especially in the Chicago-area where there is no shortage of something new and creative to try. Even the neighborhood grocery stores and Targets stock some of the beers noted in Locally Brewed. I spoke with Anna Blessing on the phone about what she discovered while writing and interviewing for Locally Brewed and of course, about what she likes to drink. How did you get into craft beer? You grew up in Portland so was it one of those things that was always around or was there a moment when you realized this beer is awesome? It was definitely always around. I feel like when I was visiting Portland when I was in college I was more aware of beer and it was more the norm. Also, I spent my summers in Northern Michigan. I still do and that was probably where I became more aware and a fan of craft beer. When I was older I started to appreciate beer more. There are many great breweries in Michigan. Shorts was one of the ones I was first kind of excited about. Bells is there, which is great. So it's the convergence of spending time in those two places and then now being in Chicago. It's not every year but every month there's a new brewery and practically every day. It's grown to be such a thing. I've always been interested in whatever is local, whether it's local food or local shops or local restaurants. And a priority of mine to seek them out and that comes a lot from growing up in Portland. Yeah, I can't begin to keep track of how many breweries are opening up in this city. Is there a particular kind of beer you prefer to drink? I love to try anything. When I first stated drinking beer I didn't like IPAs. My husband would always have these really really hoppy IPAs, and I didn't like the West Coast IPAs especially. So I started exploring more, tasting more and I started loving Midwestern IPAs with the floral hops, the ones that smell so good before you even take a sip. I find the more I try beer, the more I appreciate so many different flavors so I don't have a "go to." In the summer, I probably want to drink something fresh, light, crisp, like maybe a lager. In the winter I love having a good porter. It depends on the season and where I am and if there's something new and exciting. You wrote that you were "naturally drawn" to "sitting at a brewpub where the beer was made on-site, and getting to meet the owners or brewers, the actual people who made the beer you're drinking." Can you expand on that idea? However many years ago, we knew a lot of the people who were making our food. Whether it was the farmers or in small towns where there was a community with lots breweries. That went away for a while. Especially in the '70s, '80s and in to the '90s. I think it's so neat now that we're coming back round, even though the world is getting so big and it feels overwhelming at times. This is a way to feel more connected to the people in our cities and in our communities. We're not drinking some beer from some nameless producer from some faraway place. We can go into the brewery and take a tour and see how they make it and meet those people who are making the thing you are consuming. You get such an appreciation for those things, whether it's beer or beyond beer, whether it's food or drink or what you're buying that makes it so much more special. How did you pick the 20 breweries you featured in the book? I didn't want to do a book that was "these are the 20 best breweries." That was not my intention. I was trying to get a mix of breweries to show the diversity of what is out there right now in terms of range of geographical locations, size of the brewery, age. Some have been around for 20 years and there are ones that are just starting. I also tried to focus on places that stood out for a very specific niche they've created. Metropolitan is doing lagers. Two Brothers focuses on European styles and really good Hefeweizen. New Glarus distributes only in Wisconsin. Lakefront did the first organic and the first gluten-free beer. Jolly Pumpkin is doing sours. I'm trying to also find those places that were doing something distinct and what I consider pretty cool. Going into the book, I didn't know how varied the craft beer industry is, so it was really cool to learn about the specific stories behind the beer. And there is such a range. I have one cider place in the book, which isn't exactly craft beer but I couldn't resist because I think what Virtue is doing is very neat. I was talking to Greg Hall, who has Goose Island roots, and he said, "I don't know what we're gonna call this, but I think we might look back on it and not necessarily call it the craft beer movement but the variety beer movement." That is such a defining part of what it is. There is so much variety and diversity. You don't have to like IPAs to want to drink craft beer. There is no "cool craft beer." It's all what you love and what you want to try. One of the things that surprised me was how fanatic some people can be about specific breweries. Surly seems to have a crazy following and Three Floyds' Dark Lord Day blew me out of the water. Why do you think some people go gaga for specific breweries or specific beers? That is a good question. I think even the brewers themselves are flabbergasted. They're like, "We just want to make good beer," and people are going nuts. I think part of it is certainly whenever there's a limited quantity of anything people are going to clamor for it. Todd at Surly said, "We're not trying to short the market. We would love to produce as much as we can. But it takes hard work and time to make a good beer. We're not going to sacrifice that or compromise what we want to do with our beer." The breweries that are making it and sticking around have slowly grown their business. And with that it does take a long time to make the beer. There are some beers that are slow in production or the brewery wants to try something cool that they've never done and it's unusual and they're not sure how it's going to turn out. If they lose a production, it's a huge hit. So I think it has to do with production and beer geeks wanting to geek out and be super excited about these exclusive beers. Beer is fun to drink but Dark Lord Day takes it to a new level. A neat part of Dark Lord Day, and one of the reasons people are drawn to these events, is it brings together fellow beer drinkers. People share different things they've collected. Craft-beer drinking is so much about the community both between the brewers and consumers. While researching and writing and photographing this book, was there anything you expected to find when you set out to do interviews? Anything surprising you learned in the process about the brewers themselves, their work method, or craft beer in general? One of the things that stood out is how creative these brewers are. Not just in the beer they're making, though these are clearly creative things they're coming up with. So many came from artistic backgrounds. They're involved in creative endeavors while they're making craft beer or they want to pursue other creative things, like music. Ron at Jolly Pumpkin is hand-making surfboards. There's all these different interests. And I think making beer brings a lot of them together. They create these products from beginning to end. From naming the beer to designing the label, a ton of them are doing it themselves or working with a local artist. It's this innovative, very creative spirit almost across the board with all these different brewers. That was a very neat thing to see because beer-making is a very scientific process and you do need it be a well-made product. It's a perishable product that goes on the market so obviously science is an important part of that, but the people who are making the beer are shockingly creative. So that's one thing I found that I wasn't expecting. Being part of the community is another cool part and realizing how connected these breweries and brewers are to each other. They seek that out and do collaborations and encourage a culture that brings everyone together as opposed to competing with each other. Was there any stories or any information that you wanted to include in this book but couldn't? More breweries! I could have added 20 more. I could have done a book on Chicago. The thing that's so hard is everyone in Chicago has their favorite breweries. And I get, "Oh, did you include Revolution?" I love Revolution and they're not in the book because of space constraints. There's so many amazing breweries in Chicago alone that especially living here it's hard to say, "Well I love them, but not they're not in the book, but it's not because I don't love them!" That was one of the things I would have done because there's endless good stories out there that I didn't get to include. Do you have a beer or a brewery that you're excited about right now? Well, it's in the book, but I haven't had any of their beer yet because they're just starting out. It's Moody Tongue. I'm very excited to see what Jared does. It's supposed to be this month, April. So that's really cool to have the anticipation of that. He seems like a really interesting guy. He's sourcing ingredients from farmer's markets. He has such a food-driven beer process. I think that will be very fun and the timing with the farmer's markets opening. I think Jared is going to be doing some very cool things. I'm exited about that one too. Do you have any projects coming up? What's next for you? I did a book before this called Locally Grown where I profiled 20 small-scale farms throughout the Midwest. I told the stories of the farmers and the farms. I love talking about local people and the things they're making and doing. So, I'm probably going to keep doing that and find some more people who are making neat things.